Zhu Yuanzhang's parents grew up and lived in what we today sarcastically would label "interesting times". Mongolian armies had successfully swept through most of Asia and already had a solid foot in Eastern Europe. The Chinese lived under the yoke- and mercy of their Mongolian conquerors. The Mongolians conquered China already in the mid- to late 1200's. True to the teachings of Kubilai Khan's wise mother the Mongolians had mostly left the Chinese to rule their own country but under Mongolian supervision. In China, this period is referred to as the Yuan Dynasty, officially counted from year 1279 to 1368. But whereas this self-governing model largely succeeded in creating stability and relative peace within the Chinese community, then ironically it ultimately led to serious discontent within the Mongolians. This eventually proved to become one of the most important reasons for the downfall of their dynasty. Having both a northern- and a southern capital (the latter in Khanbaliq, today's Beijing) led to an increasing weakening of control, a massive bureaucracy and an endemic corruption. The early 1300s saw a growing divide between the traditional militant northern steppe Mongolians and the southern pro-Chinese pro-Confucian Mongolians. 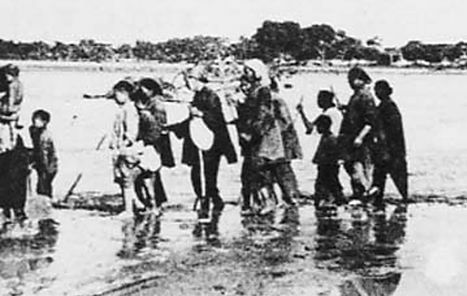 The northerners advocated a far harsher treatment of the Chinese population with strict segregation. In stark contrast, the southerners believed in a conciliatory approach and pushed for increased sinicization. Things turned completely ugly when the last Mongolian Yuan Dynasty ruler, Toghon Temür (r. 1333-1368), attempted to reinstate Mongolian authority in China. He implemented a strict segregation between Chinese and Mongolians, he confiscated weapons, horses, tools etc. from the Chinese, he forbade Chinese opera and traditional tales. Incredulously, he even suggested to slaughter 90% of the entire Chinese population. When at the same time huge flooding, severe droughts and devastating epidemics broke out the suffering Chinese revolted all over China. Completely opposite to Toghon's intent Mongolian administration broke down irreparably, control collapsed and power effectively passed to the Mongolian military. This led to huge infighting between the various Mongolian warlords, which again distracted attention from subduing the revolts and gradually allowed Chinese local warlords to cease control over an increasing part of China. Zhu Yuanzhang had experienced the heavy famine period following the flooding of the Yellow River in 1344, which silted up large areas and, worst of all, the Grand Canal. The flooding was followed by periods of heavy droughts. Farming became difficult, crops failed and widespread famine followed in its wake. All these natural catastrophes took place when Zhu was in his early to mid teens. He went through the horrific experience of seeing first his father and later most of his remaining family die from starvation while he stood helplessly by. To add insult to injury, Zhu was so poor that he did not even have the means to buy a coffin and ensure a proper burial of his father and nor did he have the plot of land to entomb his family. He merely wrapped the bodies in white clothes. Only through the grace of another villager was his family finally properly interred. This huge personal shame never left Zhu's mind. Once the Ming Dynasty had been established and things had quieted down on the home front, one of his first endeavors was to eradicate this shame once and for all by constructing a proper mausoleum, Huangling, for his parents. He placed it south of his home town, where his family had perished. Zhu Yuanzhang's paternal and maternal grandparents had succumbed early to the harsh living conditions in the first half of the 14th century. After Zhu had assumed power as dynastic ruler he commissioned a memorial for his ancestors in line with Confucian values and ancestor veneration. He decided to have the mausoleum, Mingzuling, constructed in the area where he was assumed to have been conceived. The nomadic nature of his ancestors had made it impossible for Zhu to establish with any reasonability a kind of hometown for his ancestors. 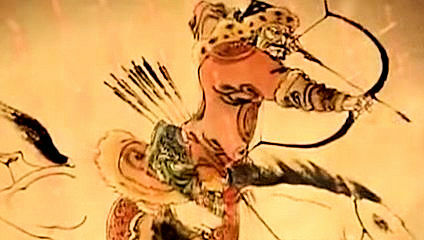 Zhu Yuanzhang early on trained his eldest son, Zhu Biao, to assume the leadership of the Ming Dynasty upon Zhu's own death. But this was not to be. After some months of illness Zhu Biao passed away 37 years old on 17 May 1392, some 6 years before his father. Zhu Biao was interred in Dongling, adjacent to Zhu Yuanzhang's own mausoleum in today's Nanjing. An apt general and military leader, Zhu's nephew Li Wenzhong (1339-1384), was one of Zhu's most solid supporters throughout the military campaigns that ultimately led to the founding of the Ming Dynasty (1368-1644). Li Wenzhong passed away under suspicious circumstances in 1384 in the then dynastic capital of Nanjing. Zhu ordered a hasty burial but chose an honorable site around the same mountain where Zhu's own mausoleum was located. Zhu identified a proper location for a mausoleum for his parents. It was situated a little southwest of his hometown of todays Fengyang in Anhui Province. The layout was relatively simple and all in a straight line. An entrance was followed by a path lined with stone figures again followed by a bridge crossing a small stream. On the other side were two memorial stone pavilions. 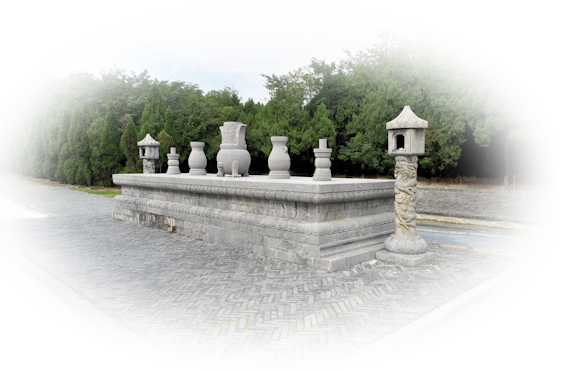 The path continued to a memorial hall for ancestor veneration and further up the path was a pedestal with five stone vessels and two stone tablets, one for each of Zhu's father and mother. Finally, in the rear an oval burial mound. The mausoleum is curiously not oriented south-to-north as good geomancy would have dictated, but rather on an almost opposite northeast-southwest line. Zhu didn't stop there. Having secured a proper burial of his parents he went on to build a mausoleum for his ancestors, located some 10 kilometers NNW of Xuyi city, Jiangsu Province. There are several speculations as to why this particular site was chosen, but the most worthy of these is the one that holds this to be the place where Zhu Yuanzhang was conceived. This layout is slightly more complex. After a triple entrance lies a dragon wall and NE thereof a large rendition of an ancient Chinese coin in front of a (newer) memorial building. A little further north is a double line of plates depicting Zhu's life and tolls. A 300 meters long tree lined path leads to the formal mausoleum entrance building. 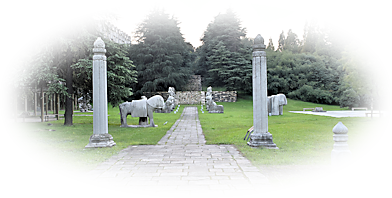 Now in a straight line follows a path lined with stone figures, a triple-span bridge, another stone figure lined path, a courtyard with four buildings, another path to a stone altar with a semicircular pond behind. Finally, in the rear, a circular burial mound. Sadly, the site turned out to be a poor choice. 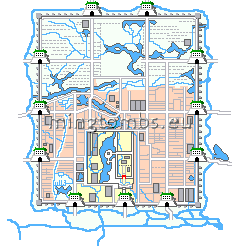 The entire area flooded, when the Yellow River and Huai River joined flow around 1680. The confluence submerged and silted over a large area including Mingzuling for some 300 years. The mausoleum was only rediscovered in the 1960's. Zhu Yuanzhang had a tomb constructed for his eldest son, Zhu Biao, when the latter passed away in 1392. The tomb was placed adjacent to Zhu Yuanzhang's own mausoleum on the southern slope of the "Purple Mountain" in the then capital of Nanjing. Zhu Biao's mausoleum follows a rather standard layout except maybe for a semicircular front wall.